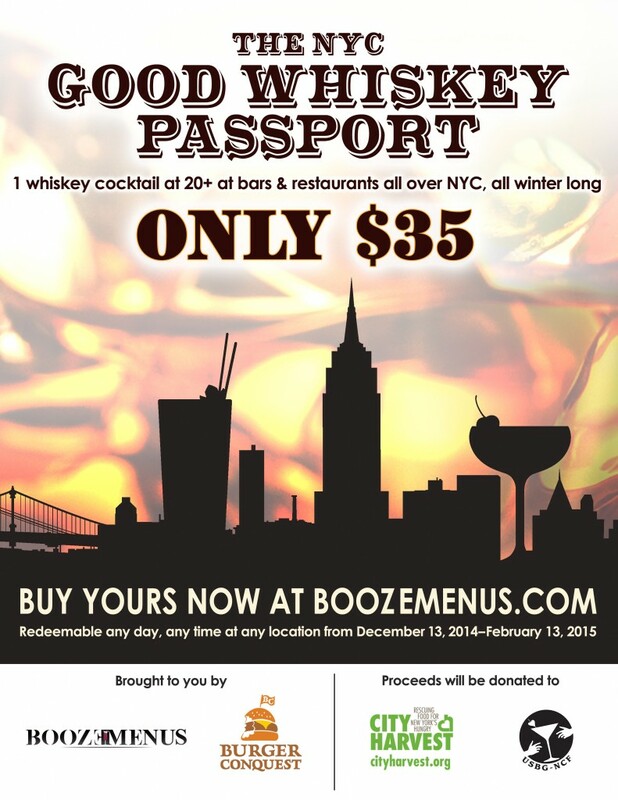 BoozeMenus and Burger Conquest to present The NYC Good Whiskey Passport, which will act as a fundraiser for City Harvest & United States Bartender’s (USBG) Guild National Charity Foundation. By purchasing a passport you’ll get one whiskey cocktail or a neat pour at every participating location. You can use them any day, any time from December 13th through February 13th, 2015. When purchasing a NYC Good Whiskey Passport, choose the location where you would like to pick up your passport. Passports are available for pick up from December 13th through January 13th, 2015. Pick up your passport at the location you chose any day from December 13th through January 13th, 2015. Bring your passport to each of the 20+ participating locations any day from December 13 through February 13, 2015 and choose one whiskey cocktail or a neat pour / shot at each location. Burger Conquest is a blog written by sales marketing strategist, David “Rev” Ciancio about Hamburgers, travel and content marketing. Rev is the Director of Marketing at Burger Maker, been featured on numerous different TV shows and named an “Expert Burger Taster” by The Learning Channel. He is also the founder of The Burger Week, an annual delicious celebration of all things Burger in New York as well as South Florida. Founded in 1982 as the world’s first food rescue organization, City Harvest is dedicated to helping feed the more than 1.4 million New Yorkers facing hunger. City Harvest will collect 50 million pounds of excess food from restaurants, grocers, bakeries, manufacturers, and farms, and deliver it free of charge to more than 500 community food programs across the city this year. In addition to helping meet the immediate need for food, City Harvest takes a long-term approach to fighting hunger by partnering with residents, local organizations and businesses through Healthy Neighborhoods programs which increase the availability of affordable fruits and vegetables in low-income communities and provide the nutrition education and resources to maintain a wholesome, food-secure diet. Our goal is to empower bartenders to take charge of their careers. We accomplish this through working with our committed partners to enrich the career advancement of our members through peer-to-peer learning, expert instruction, service projects, and competition. Since knowledge is power, our chapters hold cocktail competitions, sponsor intimate seminars with internationally recognized brand representatives, and forge relationships between top bar talent in 41 cities and counting. We offer all our members opportunities to compete, travel around the world, and spread knowledge in the pursuit of elevating our craft.